Being a manager means having tons of responsibilities and duties. As a manager, you’re not tended to fully expose your brain to store and process all events and information thrown at you. Cause, you’re simply busy.Sorry, by which I mean unnecessary information! Critical information should always be known and noticed right off the bat, very immediately. We know it, we admit it, and we put it aside for now! Assume that one of your staff in your company or organization calls 911 and you’re not around to realize about the reason—possibly you’re on a business trip or in a meeting. What if you’re operating as the sales and marketing manager of a company, and because your department has very limited telecommunication budgets, you’ve asked your subordinates to have more optimized conversations on the phone within a specified time duration. How to get notified of the long, costly calls and even international calls in your department or company? Some of the businesses and companies are living on by having a few big clients. What if one of your clients calls your company and then for whatever reason, you miss the call? You might be in a very important meeting and conversing with a board of directors, or like I said earlier, be away on a business trip. But at the same time, you’re missing your important calls which may worth thousands or millions of dollars. I’ve got a question now: do you know how many calls you have missed from your important and real potential clients so far? If not, then you’re so lucky to read this! If you have created a PBXDom call accounting account and have upgraded to a premium member, then I’m so excited to tell you that PBXDom call accounting as a powerful analytical tool is far beyond an ordinary call reporting and management service. Whether you’re on a business trip, or busy with another task, then there is no need to be concerned about your company or organization’s phone calls. 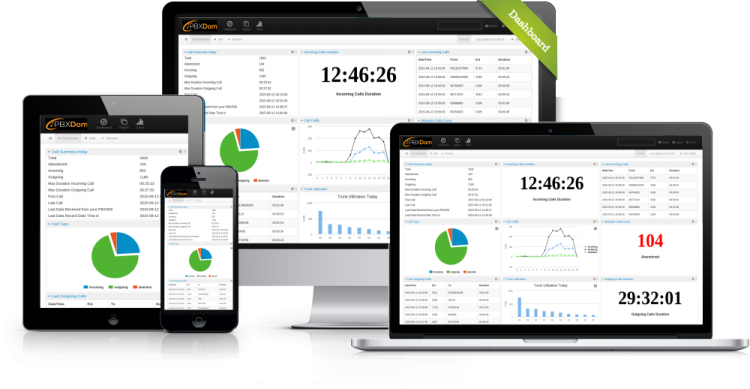 PBXDom call accounting and call analysis is equipped with alerting features and capabilities. In order to enable call accounting alerting feature, first, you need to introduce a list of all the individuals and groups you’d like them to receive alerts from the service. On PBXDom people and groups are known as Recipients. As a PBXDom user, I can make a list of all the recipients for the alerts to be sent to. All it takes is entering all the email addresses of the recipients which can be connected to the alerting section of your account. I can add as many emails as I like without being concerned that each time an alert is sent, it will be sent to all the members of the list. Later on, when I create the content of alerts, I can limit the number of recipients for each alert message to only a few recipients only. Just bear in mind, that in order to add users or groups as recipients on PBXDom, I have to verify their emails by referring to the members’ mailbox and copying and pasting their verification code by entering them in the provided field. After entering the right code, that email address will be shown verified and added to the list. In the next step, I need to go head to the Alerts section and create my alerts. Creating an alert has got a few steps. First of all, I can click on the Add button and define the name, subject, and message of my alert, and then I need to select a type for it, let’s say Email! This means that the alert will be delivered to the selected recipients via email. Or maybe you prefer sending them via Slack. So feel free and choose a Slack message from the menu list. You might be interested in knowing that there are also two other types for an alert message to choose from, like Webhook to send an alert to a specific URL, and Web App to send it to another application to be further processed. Not surprisingly, toggling on or off an alert message by setting the Status either to Active or Inactive is also possible. But wait for a second! Haven’t you sensed lack of something here? Yes, conditions of alerts! When should an alert be triggered or sent to a recipient? As the final step then comes defining conditions for my alerts. Conditions can be based on the type of the calls, incoming, outgoing or abandoned or even duration of the calls. By taking advantage of them, I can define when and why an alert is sent to the recipients. Now you know a bit more about alerts. I tried my best to cover the most critical areas of PBXDom alerting feature. But still, I encourage you to click here to be directed to PBXDom Help Center so that you get a more comprehensive and effective knowledge of it. To conclude it, now, managers are no longer concerned that they fall behind from their company or organization calls information. Take your time and set up your alerts today and then feel relax and comfortable that whenever your beneficial customer calls your company, you’ll be first to be notified about it very instantly. If you have any questions, feedback, and suggestions, please don’t hesitate to contact us.